Product code: ES8356 Categories: Antique, Antique Rings, Art Deco, Art Deco Rings & Art Deco Engagement Rings. The beautiful jewellery of the Belle Époque era of the late 1800’s through to the early 1900’s has such a delicate and lace-like quality that can be seen here in this lovely exquisitely handmade platinum Belle Époque diamond ring dating from the 1910 period. this ring could only have been made in platinum as opposed to white gold, as platinum is the only precious metal that can be drawn into such a fine wire to create the wonderful design that you see, and still be strong enough to support the rings as a whole and the diamonds in this spectacular design. In the centre of the ring is a lovely old European cut diamond that measures 0.36 carats and is then surrounded by a cluster of rose cut diamonds. 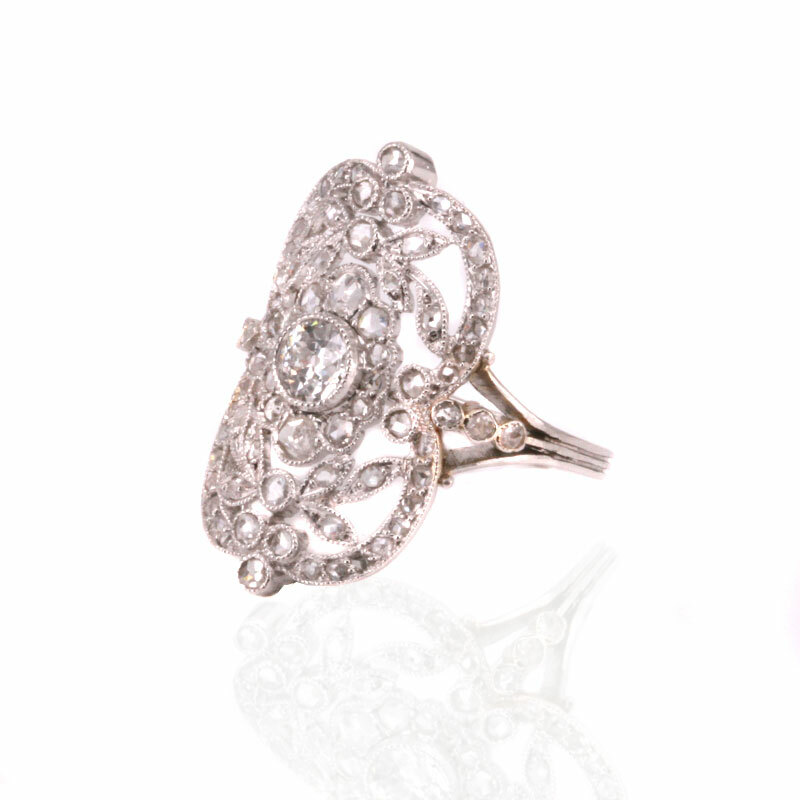 Then typical of the Belle Époque era, there are not just more additional rose cut diamonds in the ring, but they are so delicately set in a design that is simply breathtaking and a true testament to the quality of what can be achieved with hand making a ring such as this in platinum as well as the superb craftsmanship of the jewellers during this fabulous era. In total there are seventy four of the rose cut diamonds that come together to total 0.66 carats and the ring measures 20mm wide by 26mm. Not only does this ring have a wonderful presence on the finger, but there is such a subtle curve to the design that allows it to curve perfectly over the finger. And to complete the design, the ring leads down to a triple design band that adds that extra element of elegance. From every angle, this is a stunning ring of exceptional quality and one that will always be admired every single time that it is worn. Tag: Belle Époque diamond ring. The Belle Époque era coincided with the late Victorian period of the 1890’s through the Edwardian period of the early 1900’s, and like the Art Nouveau period, stopped at the outbreak of World War One in 1914.